As a coaching business we let people know about our work in many different ways. From speaking engagements to free checklists, to webinars and whitepapers. What are the free items you have created to provide for people who are interested in learning more about what you do? Is it a checklist? A downloadable FAQ? A short e-course? Over the next month I’m going to be doing a series of blog posts geared to get you into action of creating a free item or “free giveaway”. It could any of the range of items I just mentioned or something else. Each week I’ll be offering prompts here on Mondays to support you in taking weekly action around your giveaway item. What’s the one thing you wish you could offer up to your clients? OR maybe it’s a webinar that you can send out covering a key topic you coach around, or welcoming members to your site. What’s the giveaway you wish you had available? 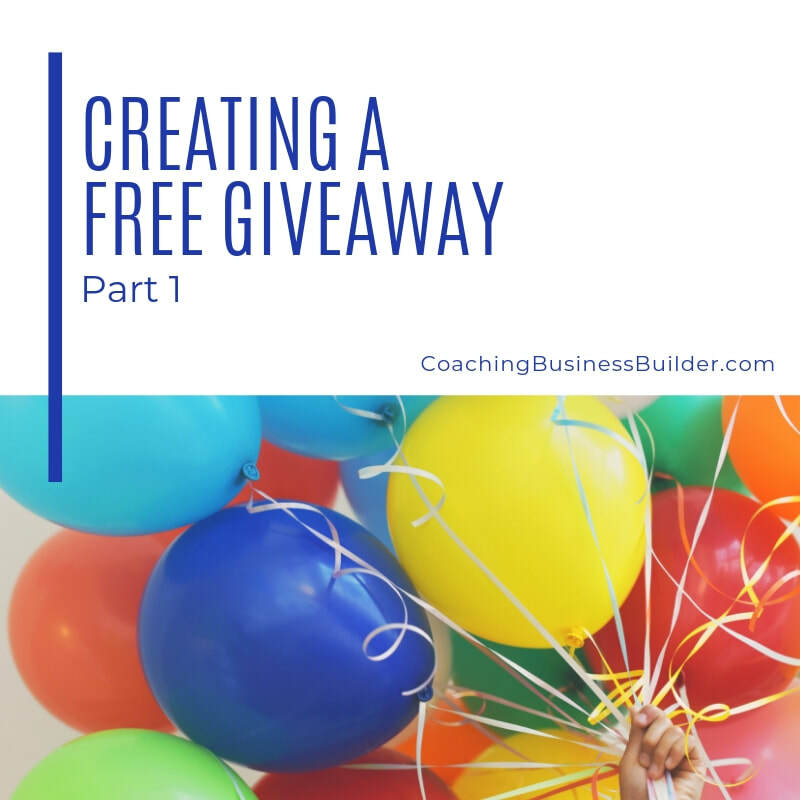 As I explain in the Coaching Business Builder, I’ve had an intentional goal to offer a different giveaway and paid offering each year of my business. These provide tremendous value in both the short term, especially in giving people an opportunity to learn more about you, what you have to offer, and how what you provide is different from other offerings. This week, my invite is for you to spend 15 minutes mindmapping all your ideas of what you could offer. What’s the one thing you always wanted to be able to offer to your clients, but haven’t made the time to create it? What are the key issues they want more resourcing around? This week capture ALL your ideas on paper. Don’t self-censure. Do some research around what’s out there already. Notice what you like, and what you would change with these resources. This week’s post gets you to explore the habits you have developed in your work and with your business. Habits defined = Habits are the activities we undertake on a regular basis, consistently and often sub-consciously so we don’t know what they are. They are the things we revert back to in times of stress or pressure. It’s important that we are aware of these as they may, or may not, be in service to us. Why they are important? Habits become automatic and sometimes unconscious ways of doing things. These can be in support of the business or not. 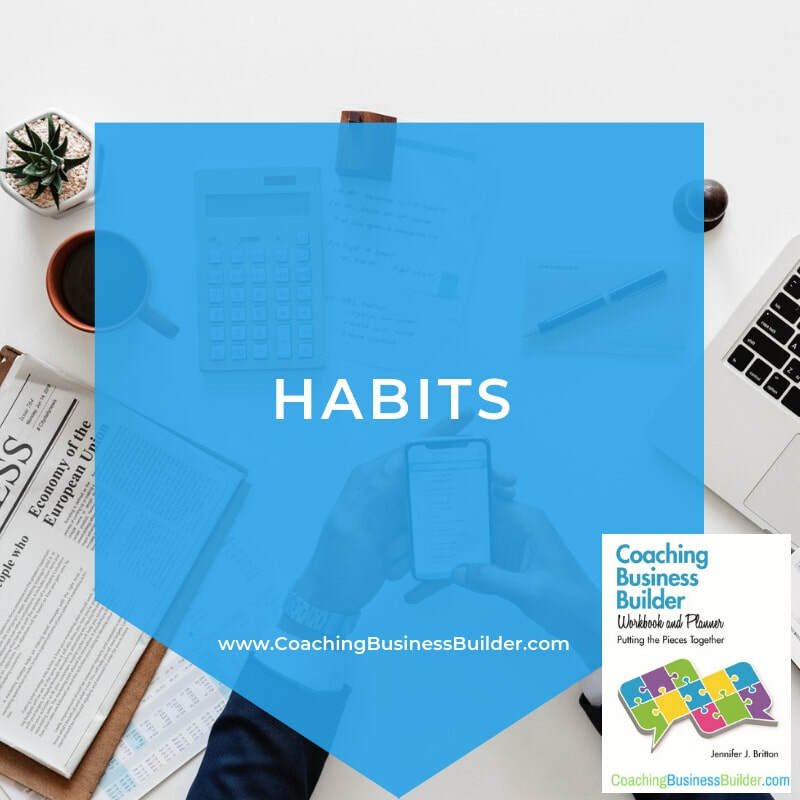 In the Coaching Business Builder Workbook and Planner on pages 23- 29, I get you to consider your habits as part of the things “below the waterline” of your business. If you have the book, take a few minutes to work through this section. Otherwise, reflect on what habits you have developed in your business, and how these are helping, and hindering, you. Make a list and note any changes you want to make. Historically, it has been thought that we take about 21 days to develop a new habit, whereas now it seems like it it more in the 60-day range. Check out this article by James Clear. 1 Biz Step a Day - April: Check It Off! One of the micro-projects I've enjoyed working on this year is the 1 Biz Step a Day series. Have you checked it out yet? Each month I am providing a series of daily action prompts. 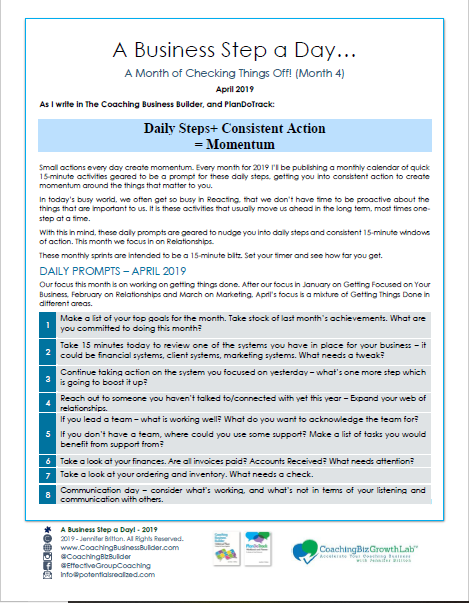 The Coaching Business Builder suite is grounded in the notion that "Consistent Action + Daily Steps = Momentum". With this in mind, I created this year's 2019 1 Biz Step a Day series. This month, in April, the theme is Check it Off! Given that this month marks the 15th Anniversary Celebrations of my business Potentials Realized, I've grown accustomed to, and look forward to, the satisfaction of "checking things off" my list for the business, knowing that somehow it keeps moving things along. I hope that you'll enjoy this month's Check it Off themed 1 Biz Step A Day. You can download it here. Be sure to share with a friend, and let them know about the Planner, and associated resources. This month at the Coaching Biz Growth Lab, we're turning our attention to Content Creation (which will be next month's 1 Biz Step a Day focus). 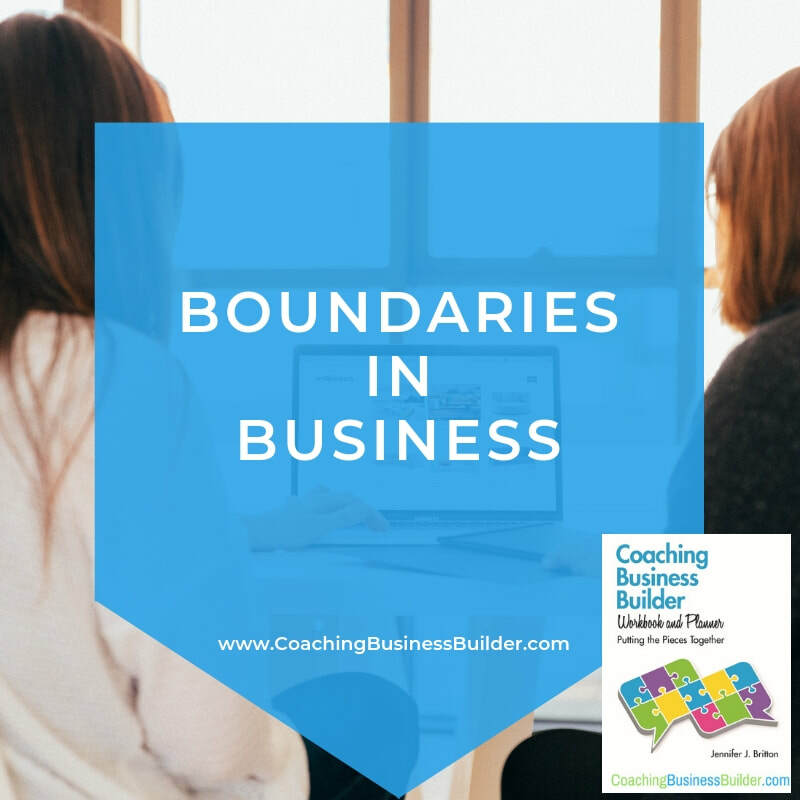 Hope you'll join me for this interactive coaching group where we come together twice a month for learning on key biz topics and ACTION on your business. Learn more here and reserve your spot. 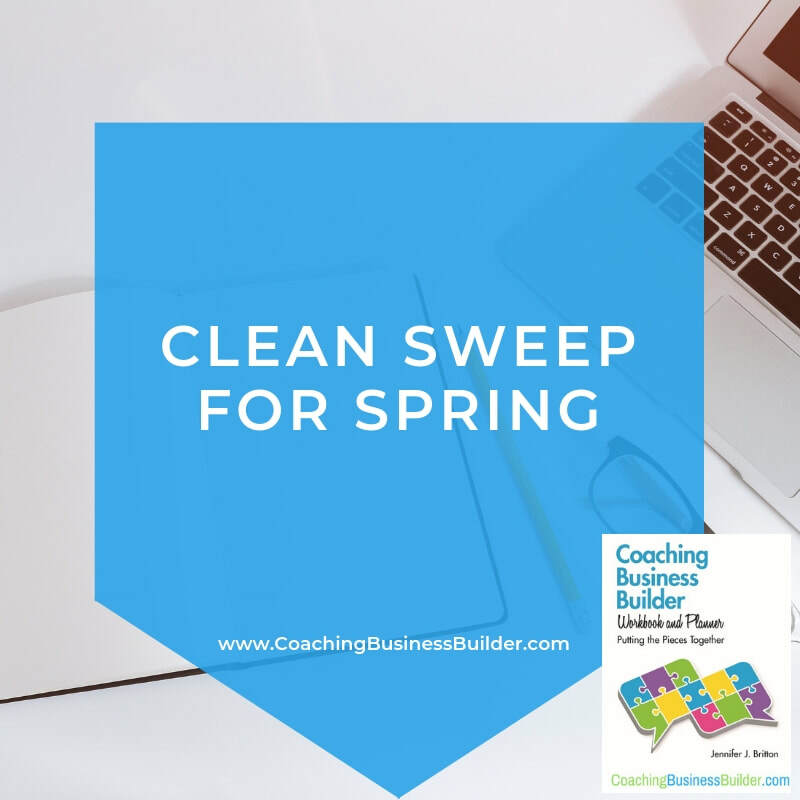 Join me this month for further posts on topics related to building your own signature program - a hot topic we've been exploring this winter and spring at both the Coaching Biz Growth Lab. and the Learning Lab and Design Studio. If you've been following along with the other 1 Biz Step a Day series, what have you enjoyed the most? What momentum have you noticed? What successes have you had? Be sure to join us for the monthly 15th anniversary newsletter which will go out later this week. It will include several goodies and also savings! Sign up here for downloads, special coaching options and product bundles. 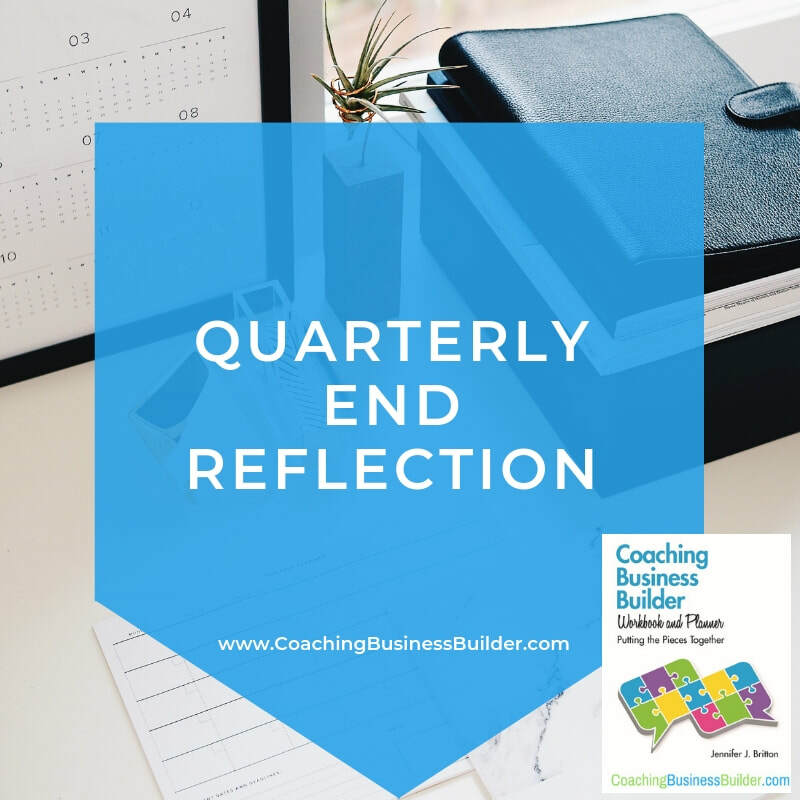 It’s officially the end of Q1 of the year, and yet another reason to pause and take stock of your successes from the last quarter and some planning for the month ahead. What successes did you have over the last quarter? ​What major accomplishments did you have? ​What were key lessons learned? ​What habits or practices helped you? What role did planning play? What forms/templates and practices supported your focus and planning? What got in the way? What do you want to make sure you don't carry forward into this season? What are your goals for April, May and June? What time are you earmarking for planning? What time is earmarked for projects? What new habits and practices do you want to put into place? What relationships do you want to put more focus around? ​What is one thing you could do on a daily basis each day of spring to move your goals forward? What relationships do you want to put attention around? ​What do you need to, and want to take action on? What else is significant for you this quarter? ​What pauses and renewal periods do you want to build in? Grab a calendar and schedule that now. ​What else will help you remain at your peak? Enjoy your reflection and be sure to update your Monthly Tracking Forms in the Coaching Business Builder/PlanDoTrack. You will also want to fill out some new Quarterly To-Dos and do a weekly breakdown (check out pages 140 and 141 of the PlanDoTrack Workbook and Planner and Coaching Business Builder). Enjoy the planning and celebrations! Looking to grow your coaching business this year? Check out the Coaching BizGrowth Lab. We meet the 1st and 3rd weeks of the month for 1 hour group coaching conversations. Focus this month is on collaboration and building community. In addition to the group calls you have access to a growing resource library of monthly articles, templates and recordings. Join us this quarter or for the rest of the year! ​This week’s post focuses on renewal. About ten days ago I got back from some glorious time away at March break. For the last few years we’ve tried to go somewhere warm during these breaks. While every year it’s the same mad rush to get things in place, and in line, it is so worth it! What are you doing to renew yourself on a regular basis? When you look back at the last few years, what are the breaks you have taken that have been important in creating memories, rather than just working? 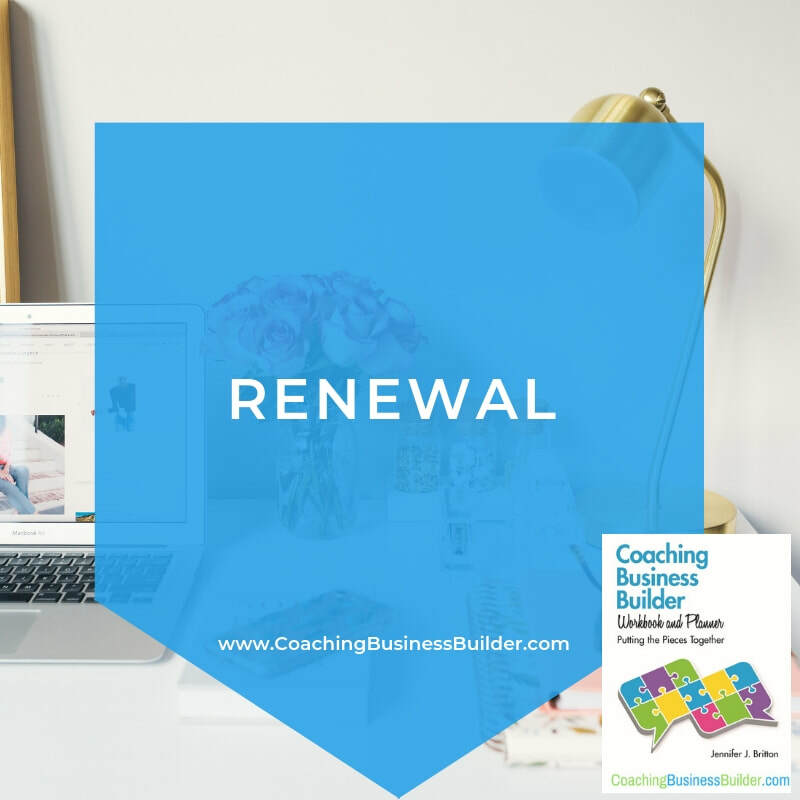 As business owners shutting off for a short while may be difficult AND it’s important to know that we too need renewal! If there’s nothing in the tank, there’s nothing in the tank! What breaks do you have planned this year for renewal? And note, to renew, you may need longer than a long-weekend. If you’ve joined me during the summer months, or read my Coaching Business Builder, you’ll know how important my time spent up north is every year. For all of July and most of August I work out of a 90-year-old cottage, river side. While my business is virtual, it’s really basic during these months as I downshift and focus more on time with family. My work days shorten so that most days I work from 6 am to noon, except for Mondays which is a full blown 12-hour day. The balanced between continued revenue and time off works well, and I actually find myself yearning towards these throughout the year. Hopefully we are enjoying our work, and not just feeling like we always have to do! What are you planning, and doing, around renewal right now? If it’s not in your spring schedule, schedule it in now, and add it as a tracker item in your Monthly Daily Tracker. Happy Spring! As we step into a new season, I hope that you will take a few minutes to take stock of the winter – your accomplishments, learning and achievement. Take a look at the Quarterly Review questions I shared a few months ago here. Today I wanted to remind you of the resource available to you here - the Weekly Sweep for Your Business. This is a one-page document you can use on a weekly basis to undertake a sweep of your work or business. The “Why” behind this document is that regular actions clear things out. As we move into a new season, there may be more energy to get things organized. If you haven’t downloaded a copy of the Weekly Sweep for your Business document, download it here. The next section gets you to outline your goals for the next seven days, with prompts for possible tasks scattered across the week. These include things such as – administrative tasks, outreach to clients/prospects, content creation, and taking 15 minutes to clear some clutter. On that note, it doesn’t need to take a lot of time to get things into order. 15 minutes at a time can make a big difference to a cupboard, a table, a filing cabinet or your email. Set the timer and see what you get done in 15 minutes! This is a document you can refer to week after week! Be sure to download it now. If this is the season to get your business into order, join us for spring (or the rest of the year!) over at the Coaching Biz Growth Lab. We meet for live group calls on the 1st and 3rd Friday afternoons of each month (3-4 pm ET) throughout the year. This April marked my 6th year of business. I continue to be reminded of the excitement and emotions of new business owners through regular discussions with participants of the 90 Day BizSuccess program - some of whom are new business owners, as well as seasoned small business people. In running the program I often get asked, what are some tips for new business owners. Here are 6 tips which have kept business exciting, and successful for me, over the years. 1. Track it! Take notice of the impact of the activities you are undertaking, over both the short term as well as the medium term. What are you noticing about the money you have invested into different marketing activities? Notice what's giving you impact in terms of your activities, networking and relationships. 2. Create Systems so that you don't have to recreate things over, and over again. It's not surprising that even experienced business owners still " have not had time" to create simple processes for their businesses such as invoices, proposal formats etc. What activities might you need to repeat time and time again (consider finance, people, marketing etc)? What systems would benefit your business? When will you spend time creating these? 3. 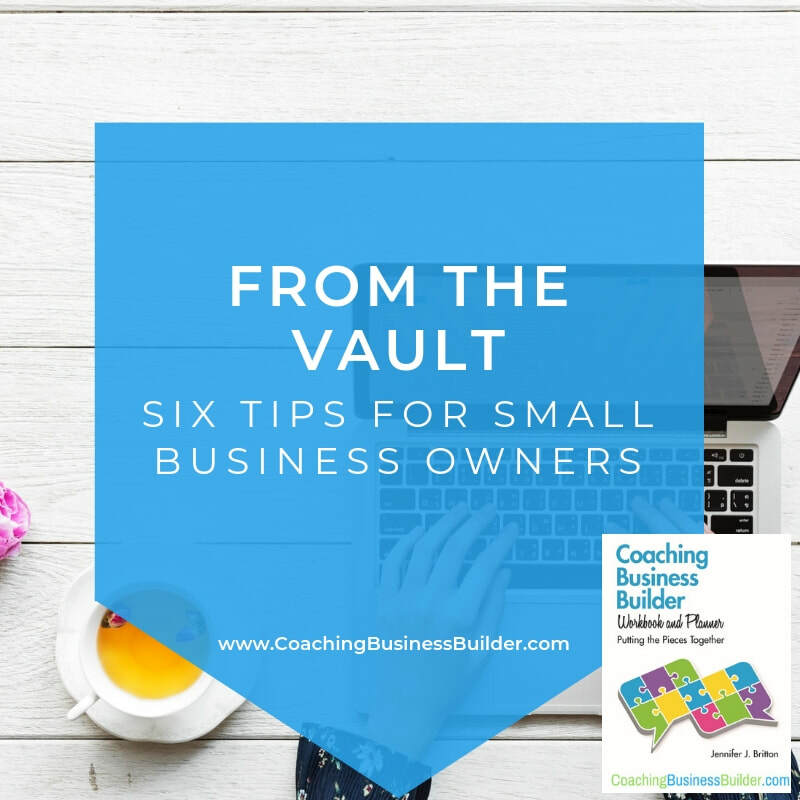 Build on What You Already Have, Have Done or Do: Many times small business owners fail to capitalize on what they have already created, designed or know. What can you build upon in your business? Do you really need to start off at 0? 4. Plan it! Time Management and Planning can be a major challenge for business owners. When was the last time you sat down to plan and strategize about your goals for the quarter or even the month? As we know from time management 10 minutes of planning can save an hour of unfocused effort. When will you spend time creating your plan for the next month? 5. Schedule It! What doesn't get scheduled, doesn't get done. What are your main business priorities right now? Have you scheduled them into your calendar? If it's not written down or blocked off chances are it may get lost. Take 15 minutes this week to identify one or two main priorities for your business and schedule in time in your calendar to get these things done. 6. Be strategic - We can't be all things to all people? Consider the Pareto Principle, or 80/20 rule, which states that we get 80% of our impact from 20% of our efforts. What activities are going to give you the most impact this month? 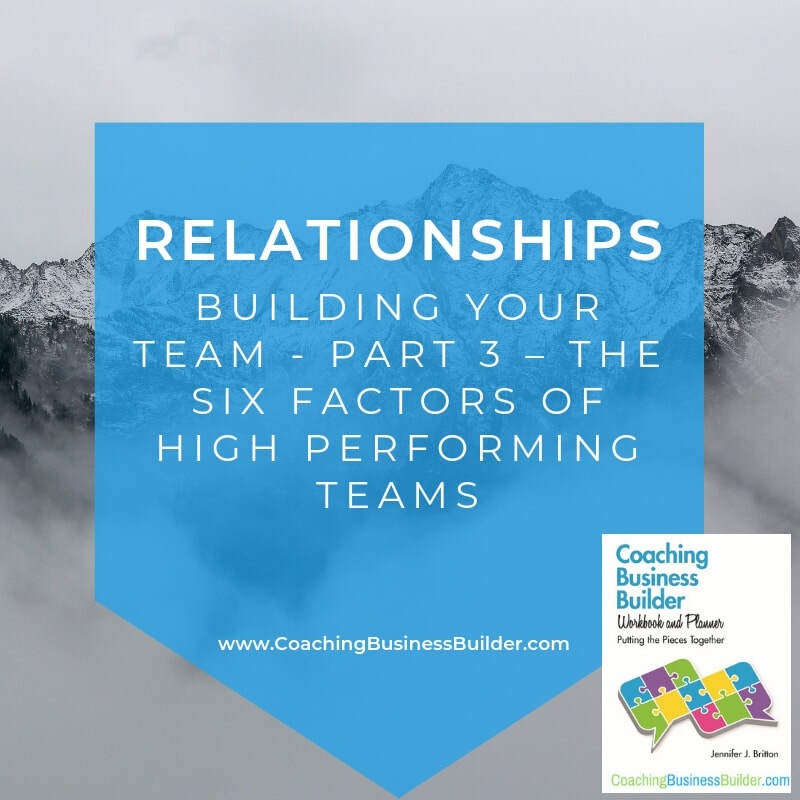 For several years I’ve talked about the Six Factors of High Performing Teams. It's likely that many of you also coach teams, or work with them in team development programs. In recent months I have had a lot of requests from coaches to share more on the six factors, and I thought that this blog post would be a great place to start. Clear performance measures – what does exceptional look like? What is required? 1. Shared purpose or mission (Your WHY) – Why do you exist? What do you take a stand for? 2. Shared behavioral norms - How you do things? What is acceptable and unacceptable on the team? 3. Shared commitment - What are you as a solopreneur committed to? What will you make sure you do, no matter what? 4. Shared performance goals (How are people measured? How do your goals align? Overlap? 5. Shared team practices - Teams that work together effectively share common practices such as a Monday morning huddle, a Thursday night out or some other regular event. 6. Clear Roles - How our roles overlap, align and connect? Facilitating discussion around these areas helps with the alignment, and clarity, required for teams to excel in today’s ever-changing environment. I hope that you will take a few minutes today to write out or capture the Six Factors of your business and/or team. For more on these, refer also to my 2017 book, Effective Virtual Conversations, pages 349 – 355. How might conversation and focus around team effectiveness benefit the teams you are working with? ​As you grow your team, what's important to keep in mind? Join me this spring for some virtual learning! In addition to the Coaching Biz Growth Lab annual group coaching group, I offer a range of ICF CCE approved programs including the Group Coaching Essentials (8.75 CCEs), the Virtual Facilitation Essentials program (8.75 CCEs) - geared to "set you up for success" with virtual programming, as well as a 10 hour Mentor Coaching Group for ACC and PCC candidates. 1 Biz Step a Day - March and a focus on Marketing! Welcome to March! For many, spring is just around the corner, but not here yet. As we step into a new month, what are your key business goals? What do you want to make sure you complete by the end of the month? What is important to put into place? What is the daily action, and consistent steps you want to take to build your momentum? Today marks the start of the 3rd monthly installment of the 1 BizStep a Day. This month, I'm supporting you through daily prompts around marketing. Imagine what 15 minutes of action each day around marketing could look like for your programs and work? Be sure to download this month's prompts for the 1 Biz Step a Day! Click here to Download. Enjoy and be sure to share your action and successes via photos with us on Instagram (#1bizstepaday). You can also share over at the Conversation Sparker Zone at Mighty Networks. I've set up this social community for those that want to explore Coaching Business Development, Virtual and Remote Team Issues, Team and Group Coaching. Sign up for one, or all, of your interest areas.